"Nature’s cruel, but we don’t have to be"
“Nature’s cruel, but we don’t have to be.” is one of my favorite quotes from Temple Grandin. 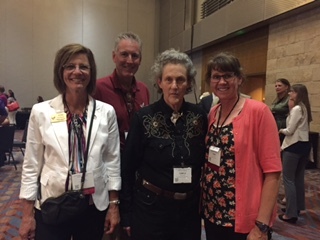 If you don’t know who Temple Grandin is, I highly recommend watching the movie “Temple Grandin” so you can learn more about her life with autism and how she has helped cattle producers like Steve and I do a better job of low stress cattle handling. Steve and I work with nature to try to minimize some of her harsher moments as we seek to give our cattle a comfortable environment to live in. presentations as she had observed several that day in need of some improvement. On our farm we administer vaccinations and treat our cattle as needed using Temple Grandin’s cattle handling design. 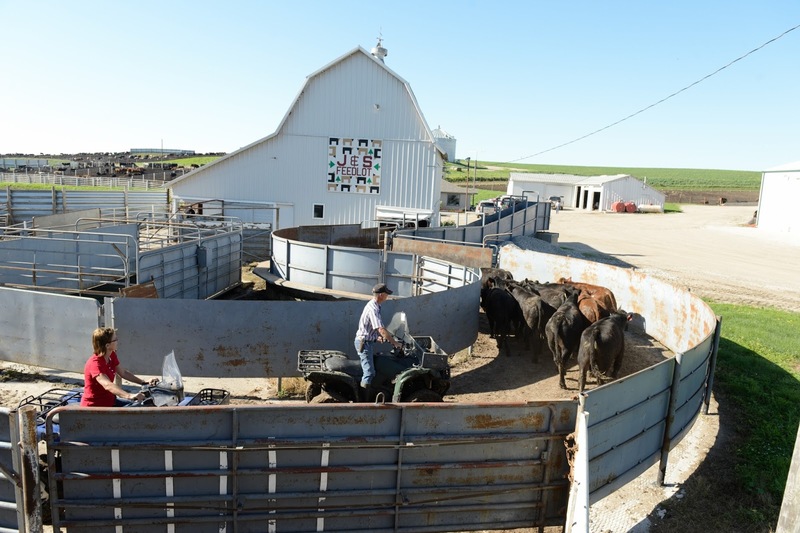 The curves, solid panels and flow of the cattle is all calculated to enable to the cattle to walk in with the least amount of stress to the animal and to people. The old days of cowboys whooping and hollering are long gone. The hum of the hydraulic chute is the only noise we want to hear or an occasional “shshsh” sound to move a stubborn steer. The ability to know what cattle can see and how they respond to our movement goes beyond the barn and works just as well in the pen. farm. Some folks use horses. The key is to move the cattle with low stress. 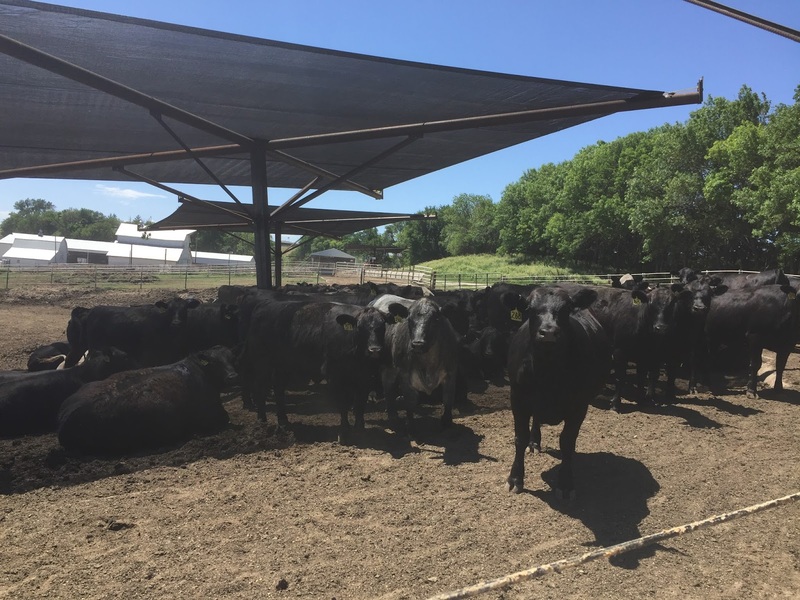 In addition to using Temple’s low stress cattle handling design we also believe firmly in the value cattle have to the environment. Cattle can eat a variety of ingredients like grass, cornstalks and grain to make protein because they are ruminant animals. From almond hulls to potato starch to corn distiller’s grain cattle convert unusable byproducts into great tasting beef. Temple has said “I think using animals for food is an ethical thing to do, but we’ve got to do it right. We’ve got to give those animals a decent life and we’ve got to give them a painless death. We owe the animal respect.” Steve and I do our best to give the cattle a decent life in the heat of the summer and the cold of the winter. use the water only if needed like high temps and no wind type of days. 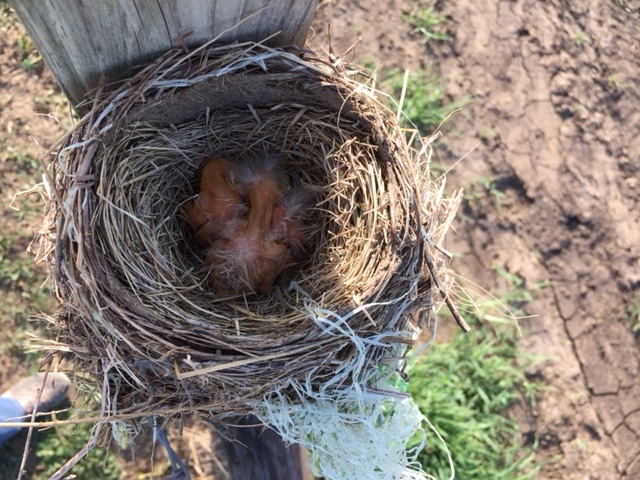 would think the hot summer days would have been tough on the little family. Through continued research funded in part by the Beef Checkoff Program, cattle producers like Steve and I can take our story from the farm to the fork with the nutritional value beef has as first food and last food for people including the latest research from the Beef WISE Study. The Beef WISE Study shows how lean beef can be used in a weight loss diet. You can read more about this study here. If you’d like a fact sheet on how to use the Beef Wise Study then click here. The fact sheet explains the 16 week/three phase plan. WISE stands for weight improvement, satisfaction and energy. That’s a pretty wise acronym! 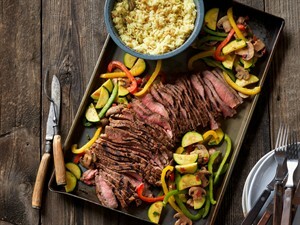 You can find the recipe for this grilled southwestern steak and vegetables here. There is much wisdom to be found through research Temple has done on cattle handling and research the Beef Checkoff has done on beef nutrition. I am grateful for all Temple Grandin has done to help farmers and ranchers like Steve and I provide quality care for our cattle. I am also grateful for the research Steve and I help pay for through checkoff dollars to help us share the benefits of including beef in a healthy diet. Ongoing research helps us continually improve cattle care so we can give you quality beef. Do you have a way of measure the temperate difference under the shade? Our lives contain both science and religion, we can't neglect religion because of science. Thank you for sharing this topic with us and letting us know the true value of both words. Thank you for sharing your comment. Have a great week!